The last area of gardening for birds that I will cover is the provision of water and soil to birds. Yes, I know you are all thinking that I have lost my mealies as your whole garden is full of soil. Well, birds have two specific needs for soil and they are at the opposite ends of the scale. Very few gardens will be able to supply in both needs and you will have to take a good look at the type of soil you have in your garden. The two types you need to look for is dry sandy soil that has a fine texture, or clays. Birds like doves, sparrows, Grey Go-away Birds, thrushes and even, on occasion, Speckled Mousebirds cannot resist a good dust bath and sunbath there after. The perfect condition for this is very dry sandy soil, which preferably has a fine texture so the dust can really get deep into their feathers. My experience has also taught me that they prefer hard compacted soil, and a bare patch of lawn in sunny position is perfect. Soon you will find the birds have scraped little hollows in the soil, and happily lie in there rubbing their bodies and kicking up dust clouds with their wings. After a good shake to remove excess dust they will lie with their backs or sides to the sun and wings spread open. I have frequently come across people thinking that there is a dead bird on the lawn, as they lie very still, and quite often are in such sun stupor that they only fly off once you get very close. 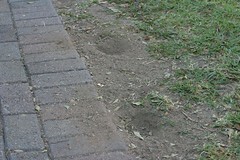 The holes they dig looks very similar to the marble hollows we had as kids, and many gardeners don’t like this as they feel it spoils their perfectly smooth lawns. These days, with irrigation systems covering every square centimetre of our gardens, there are very few dry dusty patches left. My advice is to find a nice secluded spot that receives sun most of the day and plan the irrigation around it. If you do not like open patches in your garden hide the spot behind some low plants in the back of a border, but I far prefer to have it in the open where one can view the bird’s antics. At the opposite side of dry sandy soil is wet clay. If your garden soil becomes clay when wet, you have the perfect opportunity to provide mud for swallows. That low flying Lesser or Greater striped Swallow is probably checking your awnings or stoep out for the perfect corner. If you can provide a steady supply of moist clay you will have a good chance that they might settle. It is intriguing to watch them collect the soil and build up a nest. If the nest is left undisturbed after the young have left, they will probably return each season to use it. Unfortunately sometimes with cold winters the nest may break due to contraction, or a predatory bird may break it in the hope of finding a meal. Should this happen make sure that when the swallows return there is a fresh supply of mud and they will rebuild the nest quite quickly. Water is of course one of they key attractors to a variety of wildlife to a garden. The advantage is that, regardless of the size of the garden, one can usually add some sort of feature. 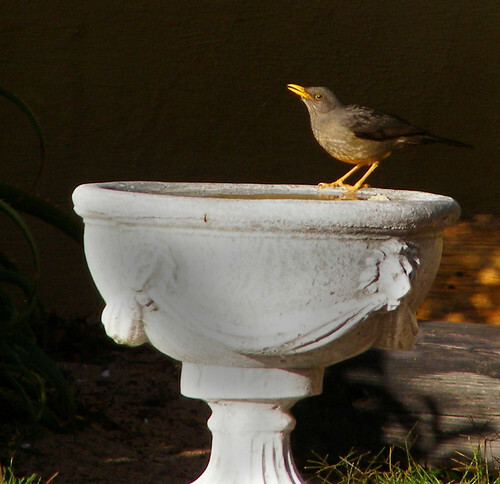 The most basic water supply to birds is probably the trusty bird bath, usually on a pedestal. Although this seems an easy solution, to become attractive to birds it requires a lot of maintenance. Due to the low depth but wide surface evaporation is very high and in summer one could be required to fill it up daily if not more. In addition the water heats up quite fast, which in turn promotes the growth of algae, especially brown algae. This means that even if you fill it up daily the water soon becomes unappealing and the bath requires frequent cleaning. Placing the bath in a shady spot improves this, but the falling plant matter could soon create a bath of decaying leaves. Birds prefer fresh running water and fortunately water features in all shapes and sizes have become more affordable. For a small garden a little rock waterfall made out of fibreglass, is easily installed in a secluded corner of the garden. These features hold more water than a bird bath and are maintained easier. Interestingly the larger the body of water in your feature, the less maintenance it will require. We all believe this to be the other way around, but a larger body of water is chemically more stable and able to break down plant matter and fish excrement into usable nitrates that water plants can absorb. Larger gardens have the space to have fountains or fish ponds installed. With fountains I have learned that one needs to be careful to notice how much water is splashed over the sides. Unfortunately not all models are set up at the retailer’s site to see this and you will have to try and asses how far the water falls between the nozzle and lowest point and how close this is to the edge of the bowl. I know someone that fills his fountain with seventy or more litres of water every week. This becomes wasteful and a very expensive exercise. I far prefer, if space allows, a natural looking pond. They attract more wildlife such as frogs and dragonflies, and are suitable for fish. When building or buying a pond it is essential to make sure that there is a shallow enough area that birds can drink and bath at. Adding fish to a garden pond adds an additional dimension to the wildlife in your garden and can attract some interesting birds. If you do populate your pond with fish to attract birds please do not do so with prize Koi! 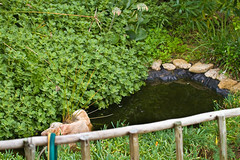 In one of my previous gardens I had a nice pond and added Banded Tilapia (Tilapia sparrmanii) or “vleikurpers”. They breed easily and are very wily making them a challenging pray for predators. In that garden I frequently had a Reed Cormorant and Grey Heron visiting, and although they caught a lot of them, I could never notice any reduction in their numbers. If you are lucky enough you might be able to attract Hamerkop and Giant, Pied or Malachite Kingfishers. Regardless of what birds you do attract, the soothing sound of running water in your private sanctuary will be enough reward on its own.